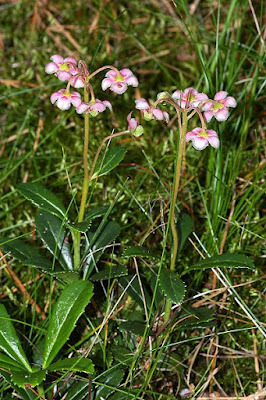 Umbellate wintergreen Chimaphila umbellata, copyright Christian Fischer. The Monotropoideae are a Holarctic clade of herbaceous plants. Members of the tribes Pterosporeae and Monotropeae lack chlorophyll, acquiring nutrients through parasitism on soil fungi (Kron et al. 2002). Characters (from Kron et al. 2002): Echlorophyllous mycotrophic herbs usually blackening on drying, stems annual, with spiral, entire, sessile, non-differentiated leaves convolute in bud. Pith homogeneous. Leaf epidermal cells not lignified, fibres not associated with midrib. Indumentum none, rarely with multicellular, obscurely glandular, hairs. Inflorescence terminal, racemose or flower single, terminal; bracts present, bracteoles none, basal or apical; calyx articulated with pedicel or not. Flowers (4-)5(-6)-merous, actinomorphic. Calyx lobes small, more or less persistent; corolla sympetalous or polypetalous, campanulate or tubular, or perianth uniseriate, more or less tubular, parts free, basally saccate, glabrous or with hairs adaxially. Stamens 10, the filaments not dilated basally, straight, glabrous or with short hairs; anther dehiscing by terminal pores or more or less elongated slits, inverting just before anthesis, appendages uncommon, small, smooth, paired, at anther-filament junction, or anthers hippocrepiform, dehiscing by slits, appendages none, surface usually smooth, endothecium at most poorly developed, pollen monadinous. Ovary (4-)5(-8)-locular, with axile to parietal placentation and many ovules per locule, superior; style usually impressed, little longer than ovary; stigma barely expanded, rarely lobed. Fruit a loculicidal capsule, berry or irregularly dehiscent; seeds with isodiametric cells moderately to massively thickened on inner surfaces, or tailed, with moderately elongated and unthickened cells; embryo minute, undifferentiated, with <30 cells; n = 8, 13, 26, 32 (x = 8, 13? ).